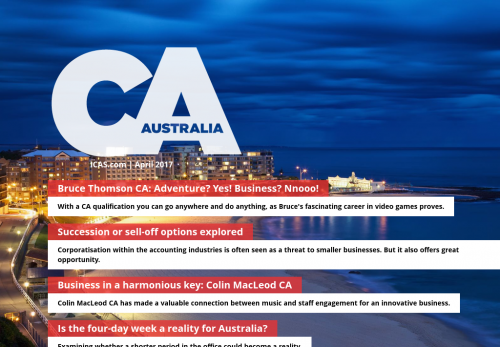 Bruce Thomson CA: Adventure? Yes! Business? Nnooo! With a CA qualification you can go anywhere and do anything, as Bruce's fascinating career in video games proves. Corporatisation within the accounting industries is often seen as a threat to smaller businesses. But it also offers great opportunity. Colin MacLeod CA has made a valuable connection between music and staff engagement for an innovative business. Is the four-day week a reality for Australia? Examining whether a shorter period in the office could become a reality.